"A wonderful, supportive group with great information and helpful suggestions." "My name is Maritza. I was diagnosed with breast cancer and currently undergoing chemotherapy. Since I discovered “Tennis For Life,” I can’t wait for Sunday to play tennis. It’s the best day of the week! Everyone makes me feel so comfortable. Sometimes, I am so tired, but I feel being part of such a pleasant group inspires me with energy and hope for the future." "From young to old and all levels of play, I learn something new, every day that I play. Playing tennis with TFL is therapy, and all the TFL members are my therapists. This is the best physical and mental support group that I've ever been a part of. " "TFL is a friendly group of Breast Cancer survivors of all ages who meet together weekly. 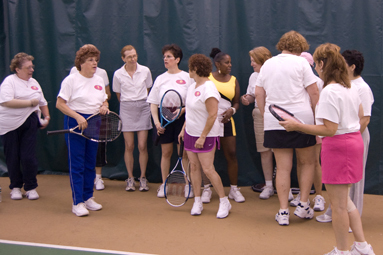 We enjoy the companionship and the experience of playing tennis for fun. I believe it works because of the relaxed sharing and bonding that heals the body and spirit." "I have been a member of TFL for 3 years+. The environment of acceptance, inclusion and support continues. A great group."